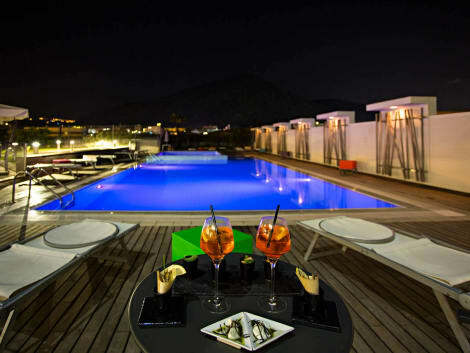 The elegant, 4-star Novotel Salerno Est Arechi hotel is a 30-minute drive from Pompeii, Paestum and Vietri sul Mare, making it the perfect starting point for discovering the enchanting Amalfi Coast and Cilento's beaches. Air-conditioned rooms. Executive r ooms and suites boast a sea view. Meeting rooms for events for up to 150 people. The Gourmet Bar awaits you with Campania specialties. For relaxation, enjoy our outdoor swimming pool (open from June to September), hammam and fitness room. Located in Salerno, La Dimora di Grimoaldo is 5 minutes' walk from the seafront and 150 metres from the cathedral. Free WiFi is available throughout the property. The accommodation has a dining area and seating area with a flat-screen TV. Some units have a terrace and/or balcony. A microwave and fridge are also provided, as well as a coffee machine. Some units also have a kitchen, equipped with a dishwasher, an oven, and a stovetop. Every unit is equipped with a private bathroom with a bidet and free toiletries. Bed linen is featured. La Dimora di Grimoaldo also includes a terrace. Guests can enjoy a meal at the on-site restaurant. The property also offers grocery delivery. Stadio Arechi is 7 km from La Dimora di Grimoaldo. The nearest airport is Naples International Airport, 46 km from La Dimora di Grimoaldo. Grab a bite from the grocery/convenience store serving guests of Home47. A complimentary buffet breakfast is served daily from 8:00 AM to 10:30 AM. Enjoy a meal at the restaurant, or stay in and take advantage of the hotel's room service (during limited hours). Wrap up your day with a drink at the bar/lounge. A complimentary buffet breakfast is included. With a stay at Villa Poseidon Boutique Hotel ****s & Events in Salerno (Historical Downtown Salerno), you'll be a 1-minute drive from Giardino della Minerva and 5 minutes from Museo Diocesano di Salerno. This 4.5-star hotel is 2 mi (3.2 km) from Salerno Cathedral. Right in the centre of Salerno, Suite 39 offers modern air-conditioned rooms with free WiFi. With neutral colours, rooms at the Suite 39 B&B also include a 32" LED TV, a memory-foam mattress, and an electric kettle. The property is just 300 metres from the sea promenade and a 10-minute walk from Salerno Train Station. Amalfi is 25 km away. You can find shops and restaurants in the immediate surroundings. Make yourself at home in one of the individually decorated guestrooms, featuring refrigerators and flat-screen televisions. Your pillowtop bed comes with premium bedding. Complimentary wireless Internet access keeps you connected, and digital programming is available for your entertainment. Private bathrooms with showers feature rainfall showerheads and complimentary toiletries. Make use of convenient amenities such as complimentary wireless Internet access, tour/ticket assistance, and a reception hall. Getting to nearby attractions is a breeze with the area shuttle (surcharge). Albergo Del Centro Storico is in front of Salerno's Town Hall and near the Verdi Theatre. The functional rooms offer LED TV, free Wi-Fi, and a balcony. You will be 100 metres from the port, and 900 metres from the train station. Croissants and coffee or cappuccino are served for breakfast at the Centro Storico, either in your room or at the owner's nearby café, where check-in takes place. The restaurant serves Mediterranean cuisine as well as light meals and a great selection of wines, or guests can enjoy a pizza at the on-site pizzeria. 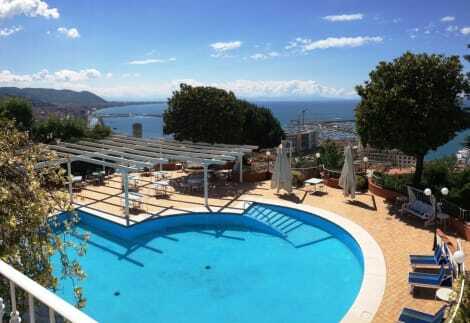 The hotel is 3.5 km from the A3 motorway and a 25-minute drive from Amalfi. Public buses to the Amalfi Coast, Pompei and Paestum stop just 20 metres away. Featured amenities include a business center, multilingual staff, and a safe deposit box at the front desk. For a surcharge, guests may use a roundtrip airport shuttle (available on request) and a train station pick-up service. Located in Casal Velino, Hotel Leucosya is in a national park, within a 10-minute drive of Casal Velino Marina and Velia Ruins. This 4-star hotel is 1.5 mi (2.3 km) from Casal Velino Watchtower and 17.7 mi (28.5 km) from Caves of Palinuro. 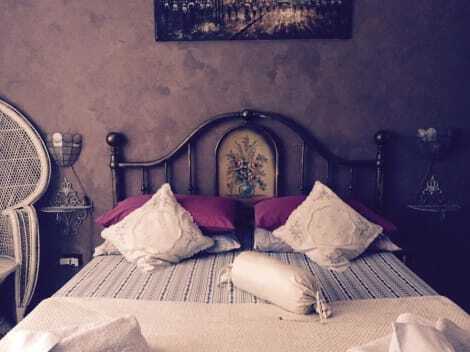 lastminute.com has a fantastic range of hotels in Salerno, with everything from cheap hotels to luxurious five star accommodation available. We like to live up to our last minute name so remember you can book any one of our excellent Salerno hotels up until midnight and stay the same night.